Once upon a time, while the town was being decorated for Christmas, a small miracle took place in the atelier of Karl Lagerfeld's castle - "mon shu girl" - mon shu girl escaped from his sketchbook - a "dessin" came to life! Spreading colorful times and holiday sparkle to girls all around the world, mon shu girl dons Karl Lagerfeld's iconic look and awakens the sleeping beauty that lies deep within. This holiday season, shu umera and Karl Lagerfeld send a miracle of color and beauty that is a gift for every girl. Wearing the Khaki Eyeshadow from the Karl for shu Smoky Velvet Eye and Cheek Palette and the Glow-On Blush. The Karl for Shu smoky Velvet Eye and Cheek Palette features a luxurious mix of classic and modern colors in limited edition colors and case inspired by Karl Lagerfeld himself. Chic colors and velvety smooth textures create a mesmerizing beauty inspired by Karl Lagerfeld’s fashion designs. The palette features an inner mirror with a charming touch - mon shu girl’s shadow appears as a translucent silhouette. The ‘SUKL’ logo and graphic red and black dots are embossed on eye shadow. The mon shu girl appears against a classic red background on the palette case setting the tone for this moody palette. Dusty rose glow-on blush (6) on the cheek to give an impression of sophistication. 1 sponge-tipped applicator and a dual-ended brush. The Karl for shu eye and cheek palette in Smoky Velvet has a mix of 2 silky smooth satin-shimmer eyeshadows and 2 predominantly glitter eyeshadow accents in silver and gold. The lone matte eyeshadow is a matte pale mint green shade. The first two shades - black and khaki green - are buttery smooth, intensely pigmented, and have fine shimmer scattered throughout yet are easy to blend. The two eyeshadow accents are mostly glitter and are best applied by patting down the color on the skin. The minty matte shade works well as a highlighter shade as well as for blending along the crease. The sixth shade is a dusty rose blush that is insanely pigmented and definitely one of the longest-lasting blushes I have come across! Here's a look at the swatches. My favorite from the palette has to be the blush - just a tiny bit of the blush gives tons of colour, and it just stays on and on. 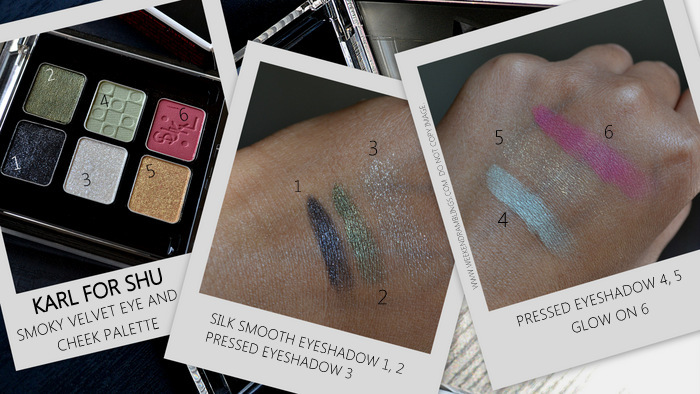 Among the eyeshadows, as someone who loves a smoky eye, I have to pick the khaki and black as my winners. The khaki eyeshadow is so soft, it's almost like a cream eyeshadow but also needs a heavy-duty primer to stay in place on my oily lids. The Karl for shu palette does the grown-up version of shimmer - it's sparkly yet doesn't fly around the face and in a way is quite subdued! The two shadow accents in gold and shimmer would work great as an all-over-lid sheer wash or can be used to add a touch of sparkle to a darker eye. My one complaint with this palette would be the size of the blush - the only brush that fits into the pan is the one included in the palette, which makes application and blending a bit difficult. With it's unique packaging and a fun mix of colours, the Karl for shu Smoky Velvet Eye and Cheek palette would make a great holiday gift for anyone who appreciates a bit of colour and sparkle this time of the year! Excellent n clear review, thanks Radhika. You are looking pretty in the pictures and the applied palette suits you very well. Take my advice!!! Send me nice giphts and earn some good karma. That in addition to my blessings will help you get rid of the eye problem. This is just beautiful. The colours suit you so well! Especially shade #2. Oooh you got it?! SO pretty! I've never tried ANY Shu color cosmetics before and it's obvious I'm missing out!